NYC, 02/14/2019, 6:30PM. 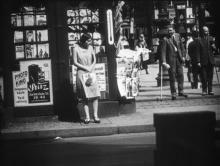 People on Sunday (1930): silent film about Weimer-era Berlin, experimental film which became a mainstream hit. An effervescent, sunlit silent film about city dwellers enjoying a weekend outing in Weimar-era Berlin. Years before they moved to Hollywood, four young German filmmakers—later noir masters Robert Siodmak and Edgar G. Ulmer, and future Oscar winners Billy Wilder and Fred Zinneman—collaborated on this effervescent, sunlit silent about city dwellers enjoying a weekend outing in Weimar-era Berlin. Combining documentary footage with dramatic storytelling, this experimental film became a mainstream hit, presaging both Italian neorealism and the French New Wave.